The special formula designed for the improvement of immune system Host Defense MyCommunity Capsules is the blend of 17 mushroom species. This is the natural immunity increase product comprehensive formula that you can buy online in Pakistan at your home with cash on delivery. It is the unique blend of mushroom mycelium and fruit bodies that really balance the immune system. It is the effective and high performance product to buy online at your place with the facility of cash on delivery. 100% organic ingredients are best and recommended for best results. 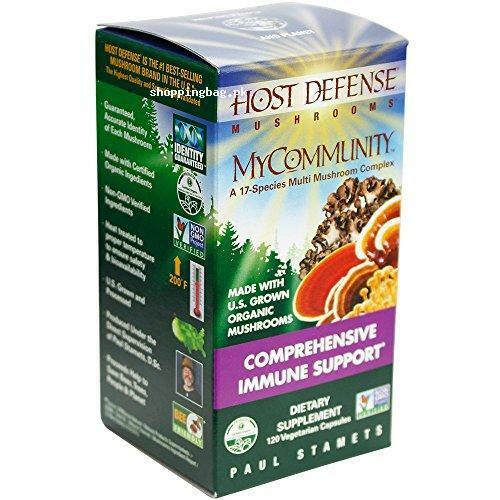 You can get this product at your place with cash on delivery placing your order online to buy this host defense MyCommunity Capsules Comprehensive Immune Support and other quality products imported from Amazon. PEAK PERFORMANCE: At their optimal rate of growth, the mushroom-forming mycelium are flash-frozen, capturing a full spectrum of constituents at peak performance. SUSTAINABLY CULTIVATED: When sourcing mushrooms from the pristine Olympic rainforest, our team leaves the habitat and original mushroom intact and undisturbed. Only a small sample is required and taken for growing in the laboratories at the farm. Host Defense methods protect the native habitat.